Long time chart component developer Steema Software released a new version of Teechart Pro in late 2013 which supports Delphi XE5 Firemonkey on mobile devices. If you need cross platform charting in Firemonkey on IOS and Android this may very well be the ultimate charting component. It can export your charts to all kinds of formats like PDF, JPEG, GIF, PNG, and even Flash. You can also use Teechart to export data to HTML, XML, and Excel formats. 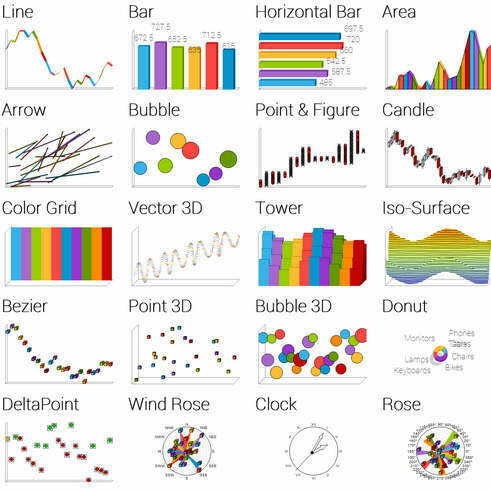 There are 30 palette components that come with Teechart Pro and you can create 63 different styles of charts using the components. Additionally it has 8 gauge styles, 25 image filters for the charts, and 46 chart tools you can use to manipulate the charts. It is a commercial component and comes with full source code. There is also an evaluation version available so you are able to fully test the component set for free. The Pro version of Teecharts can also be used to render maps from ESRI Shapefile format. Check out the evaluation version of Teecharts Pro for free.